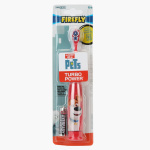 Juniors The Secret Life of Pets Battery-Operated Toothbrush | Multicolour | Provide your children oral care with Vibrating Action for Deep Cleaning. Ensure that your little one is not bored even while brushing teeth by getting this battery-operated toothbrush. Sporting the theme of The Secret Life of Pets, this BPA-free toothbrush has soft bristles that gently clean your child’s teeth while the vibrating action offers deep cleaning and massages the gums. Feature 2 : Gently massage action stimulates gums. Soft bristles are gentle on gums and teeth. Feature 1 : Provide your children oral care with Vibrating Action for Deep Cleaning. Feature 3 : Secret Life of Pets character ensures your little ones will not get bored. Includes battery.